I knew this would happen, sooner or later. I work in a library, and, whenever the phone rings, before answering, I mentally review my standard greeting, which is simply to identify the library and give my name. I do this because a certain phrase has been stuck in my mind for a quarter of a century, firmly entrenched and trying to pop out of my mouth every time I pick up the phone. "Northeastern Navy Band, Petty Officer Mullen speaking. This is an unsecure line." Just as I was about to add "May I help you, sir," I realized what I was doing. It was the president of the library's board of directors, my boss's boss, the civilian equivalent, you might say, of the admiral. Fortunately she has a sense of humor. In fact, she laughed so hard, I doubt she heard the names I was calling myself. The Bureau of Personnel has authorized a special designator for Navy Musicians who completed recruit training as members of regular rifle companies. "Rifle Company musicians are a special breed," said RADM Vincent Tremont, Vice-chief of Training Systems Command. "They are the vital core of Navy music, the salty MUs who went through bootcamp 'the hard way.'" Recruit training commands traditionally form bands from volunteer recruits who, in exchange for playing at graduation ceremonies and off-base functions, skate through bootcamp, skipping drills, flitting from rehearsal to performance and marching in civilian parades. "The new designator recognizes that bootcamp is not a party; it is an experience designed to test and train the Navy's future leaders. And the Navy MUs who have undergone training in regular rifle companies have proven to be the he-men, the she-women, the muscle of Navy music. Christmas is forgotten, the New Year's hangovers are long gone and even the Super Bowl is history. It's winter in Illinois, and there's nothing to look forward to. Illinois needs a beacon of hope to light up these cold months of Midwestern misery. I propose a new winter holiday, an entire season devoted to remembering the bravery of that certain stalwart group of Americans who have braved and survived the worst that an Illinois winter can devise. "Boot Camp," as I'm calling this new celebration, honors all those who, like me, participated in recruit training at Naval Training Center, Great Lakes, Ill., during the brutal depths of winter. If this seems silly, please remember that, like some of our favorite holidays, Boot Camp is for children. The season begins one morning in the middle of February when tots awaken, run their hands across their freezing scalps and realize they've had a visitor during the night. They run to the nearest mirror and find that Stubby, the Navy barber, has cut off all their hair in their sleep. Oh, how the children enjoy Boot Camp! Each morning they make their beds and then stand at attention while their father tells them how worthless they are. Patience exhausted, he screams, throws their mattresses on the floor and gives them 30 seconds to make their beds anew. When the children again disappoint Dad, he leads them outside in their pajamas and makes them do push-ups in the snow. Grownups enjoy festive Boot Camp parties whose menus replicate the meals enjoyed by recruits at Great Lakes: uncooked hot dogs with no buns or condiments, Dixie cups half-full of cold beans and a lukewarm Kool-Aid substitute made from sugar, food coloring and dishwater. Boot Camp music fills the chilly air. At night, when the children are in bed and out of earshot, adults sing "She Looked So Young and Pretty," the marching song I wrote at Great Lakes after my recruit company attended the lecture on sexually transmitted diseases and watched a film whose closeup shots showed what can happen to a sailor's anatomy when he does things he shouldn't do with people to whom he is not married. Throughout the movie, recruits groaned in horror. By the time the lights went up, three men had passed out and one had joined the priesthood. The call-and-response marching song I based on this movie was so popular that Company 397 was constantly requested to parade around the Naval Training Center for the enjoyment of the training staff. Sadly, the words cannot be printed in this publication. The Boot Camp season abounds with such happy melody. February becomes March in a flurry of push-ups and haircuts. Finally, on Boot Camp Graduation Eve, the children pack their clothing in their seabags and go to sleep. When they awaken, they find they have been visited by Chief Furioso, the Drill Instructor, who has dumped the contents of their seabags on the floor. Yet, hearts are joyful, for it is Boot Camp Graduation Day. The children Pass in Review, Mother hands out diplomas and the whole family sits down to a graduation dinner of uncooked hot dogs, cold beans and pink dishwater. Someone notices that birds are singing and the sun is shining. Laughing Illinoisans throw their hats in the air and shake each others' hands. Boot Camp is over, spring is here and the depression of winter in Illinois is forgotten. If there's one thing the Navy Musicians Association needs, it's pianists. Our reunions feature big band rehearsals that start in the AM and and jam sessions that last well into the PM, so we're always trying to recruit one more piano player. I'm happy to say I've found one: Drew Williams. Drew's qualifications are perfect: Navy. MU. Although he and I haven't met face-to-face, I've corresponded with him over the Internet and seen video clips of him playing both solo and with a rhythm section. As you'll see by watching the clip below, this fellow has jazz chops to spare. 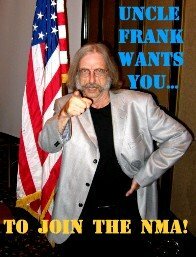 I'd love to have my newest shipmate join the Navy Musicians Association and take part in the fun, camaraderie and music of our reunions. There's just one little problem: Petty Officer Drew Williams is in his early 20s and currently lives in Yokosuka, Japan, where he serves with the Seventh Fleet Band. Our job is to keep the Navy Musicians Association strong so that whether an MU does a single hitch or serves for a full career, the NMA is a vital and attractive opportunity. And, yes, recruiting new members is also crucial. In this case let's just say I'm planning ahead.